Scientists at the European Organization for Nuclear Research (CERN), in Geneva, set off a record-breaking particle collision in the Large Hadron Collider Wednesday night. 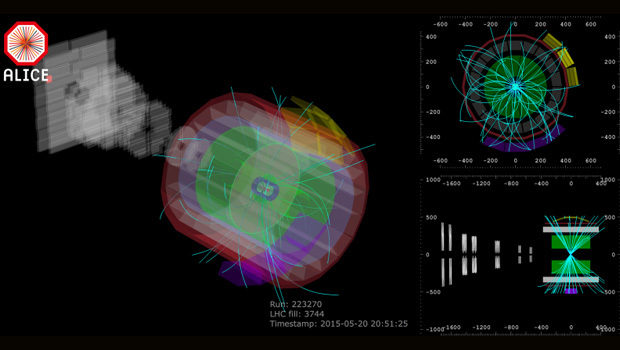 After a two-year hiatus, the LHC produced its first proton beams in April, followed by the first proton collisions at a lower energy. Wednesday was the first time LHC housed particle collisions at its new maximum power of 13 trillion electron volts (TeV), twice the power of the first round of science experiments, which concluded in early 2013. The collisions were created to test systems that protect the machine, magnets and detectors from damage by stray particles, according to CERN. This includes setting up the collimators, which absorb strays, and is one of many steps required to prepare for the next run of the collider, when scientists will use it to try to create and observe dark matter. "When the positioning of all collimators has been validated the LHC will switch over to production mode," said Jorg Wenninger of the LHC operations team, "and become a 'collision factory', delivering data to experiments." The start of LHC's second run is planned for early June.